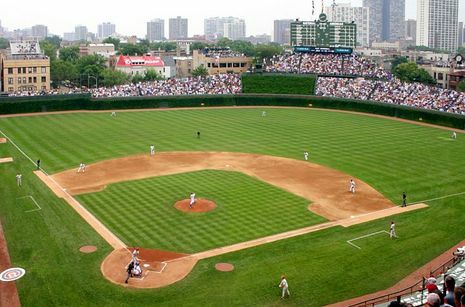 -- Weeghman Park was the home of Chicago's entry in the Federal League and was the property of Charles H. Weeghman ... the club was known as both the Federals and the Whales. 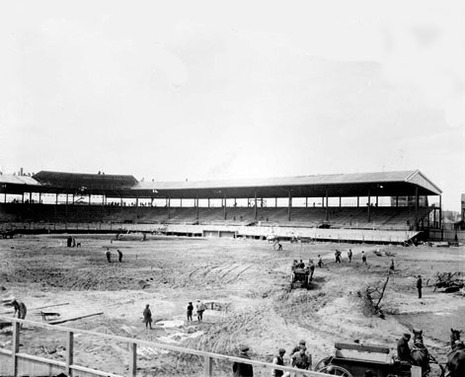 -- The cost of building Weeghman Park, which had a seating capacity of 14,000, was estimated at $250,000 ... the infield and outfield consisted of more than 4,000 yards of soil and four acres of bluegrass. 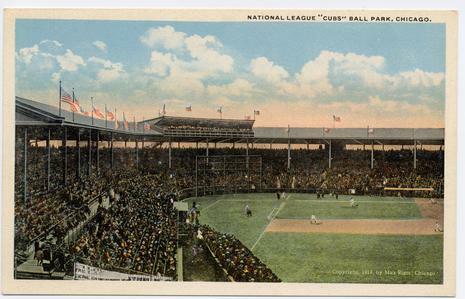 -- The first major league game at the ballpark took place April 23, 1914, with the Federals defeating Kansas City 9-1 ... the first homer in ballpark history was hit by Federals catcher Art Wilson - a 2-run shot in the 2nd inning off Kansas City's Chief Johnson. -- When the Federal League folded for financial reasons after the 1915 campaign, Weeghman purchased the Cubs from the Taft family of Cincinnati and moved the club to the two-year-old ballpark at the corner of Clark and Addison streets. -- The first National League game at the ballpark was played April 20, 1916, when the Cubs beat the Cincinnati Reds 7-6 in 11 innings ... a bear cub was in attendance at the game. -- The park became known as Cubs Park in 1920 after the Wrigley family purchased the team from Weeghman ... it was named Wrigley Field in 1926 in honor of William Wrigley Jr., the club's owner. The park was built in six weeks in 1914 at a cost of about $250,000 ($5.3 million in 2008 dollars) by the Chicago lunchroom magnate "Lucky Charlie" Weeghman, who owned the Federal League Dolphins. (The club signed a fifty-five-year lease to use the park for app $18,000 per year.) It was designed by the architect Zachary Taylor Davis (who four years earlier had designed Comiskey Park for the Chicago White Sox), incorporating the new "fireproof" building codes recently enacted by the city. According to some sources, when it opened for the 1914 Federal League season, Weeghman Park had a seating capacity of 14,000. According to another source, the original seating capacity was 20,000. In late 1915 the Federal League folded. The resourceful Weeghman formed a syndicate including the chewing gum manufacturer William Wrigley Jr. to buy the Chicago Cubs from Charles P. Taft for about $500,000. Weeghman immediately moved the Cubs from the dilapidated West Side Grounds to his two-year-old park. In 1918 Wrigley acquired the controlling interest in the club. In February 1926, he renamed the park "Wrigley Field." In 1927 an upper deck was added, and in 1937, Bill Veeck, the son of the club president, planted ivy vines against the outfield walls. Wrigley Field was a hold-out against night games, not installing lights until 1988 after baseball officials refused to allow the Cubs to play any post-season games without lights. Night games are still limited in number by agreement with the city council. Capacity is set at 44,250. Many firsts were started at Wrigley Field, including permanent concession stands and permission for fans to keep foul balls that are hit into the stands. The bleachers and scoreboard were both constructed in 1937 and are still manually operated. Incidentally, the scoreboard has yet to be struck with a ball in play. Ironically enough, however, it was hit by a golf ball teed off by Sam Snead inside the stadium. Bill Veek, who built the bleachers and scoreboard, is also responsible for the landscaping throughout Wrigley Field.